Battle of Las Animas Canyon Monument & Buffalo Soldier Cemetery – Victoria Park*, NM Quadrangle – amTopo by Apogee Mapping, Inc.
On September 18, 1879, Buffalo Soldiers (African-American regiments formed after the Civil War) serving with Companies B and E of the 9th U.S. Cavalry based in Fort Stanton, New Mexico, were ambushed and pinned down by the infamous Chief Victorio and approximately 60 of his warriors from the Warm Springs band of Chiricahua Apache. 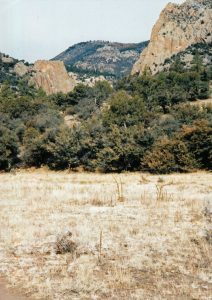 As the soldiers pursued Victorio into the mouth of Massacre Canyon (named after this incident) where it joins Las Animas Creek, the soldiers quickly became trapped and forced afoot as their mounts were shot from under them by Apache warriors camouflaged and holding positions high above in the steep, rocky canyon walls. Two nearby companies, C & G, also in pursuit of Victorio, heard the gunfire and came to assist, but they too, were instantly pinned down. The battle raged for hours until finally the soldiers were able to retreat under the cover of darkness. During this tumultuous period in the desert southwest, the Warm Springs Apache had already been removed from their native lands at Ojo Caliente, and forced to live with their sworn enemies on the San Carlos Indian Reservation in Arizona. After having escaped San Carlos twice, the Warm Springs Apache were eventually relocated to the Mescalero Apache Indian Reservation at Fort Stanton, New Mexico, but due to incredibly poor living conditions and catching wind that the government was to send the group back to San Carlos, Victorio and his warriors fled again, swearing never to return. Thus began his most violent rampages throughout the region, and in turn, the 9th Cavalry’s arduous and dangerous pursuit. Official military reports of the event vary, but list either five or six troopers killed, two or three Navajo scouts killed, one civilian killed, and 32 horses killed in the battle. No Apache were believed killed. Oddly, none of the reports seems to directly correlate with the 32-plus actual graves at the monument site. Three soldiers, Lieutenant Robert Temple Emmet, Lieutenant Mathias Day and Sergeant John Denny received the Congressional Medal of Honor for acts of bravery during the battle. Located on private property that was homesteaded shortly after the Victorio War, the Buffalo Soldier/Massacre Canyon Cemetery was officially dedicated with full military honors on June 14, 1997 as a result of research efforts by the New Mexico Home Town Heroes Committee for the National Medal of Honor Society and the New Mexico Army National Guard. 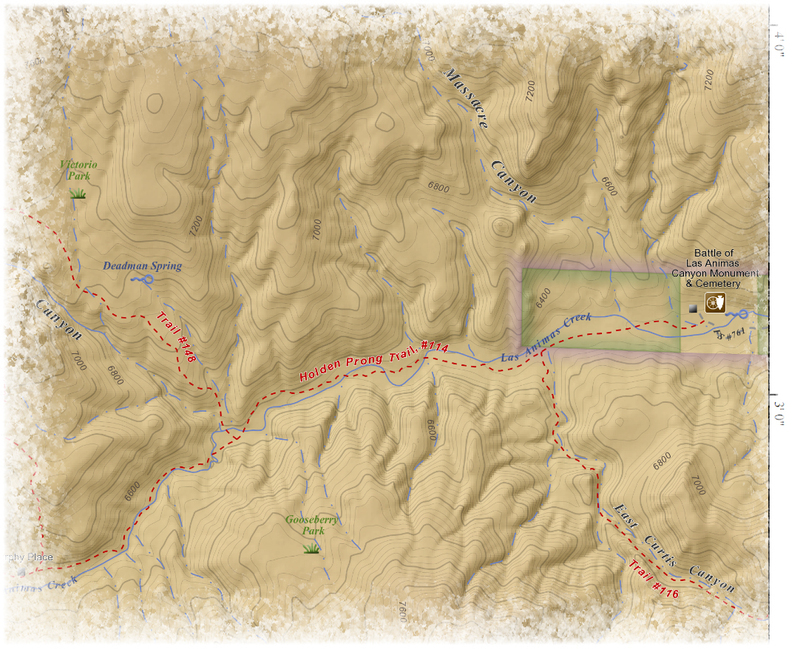 Much of the actual battlefield lies just to the northwest on Gila National Forest land. * Despite encompassing the homeland of Victorio and his people, this USGS Quadrangle was incorrectly named Victoria Park. The US Forest Service is now using the correct nomenclature.